Joseph Robert Theismann was born on 9 September 1949, in New Brunswick, New Jersey USA, to mother Olga Tobias of Hungarian descent, and father Joseph John Theismann, of Austrian descent. He is a former American Football player, sports commentator, corporate speaker, restaurateur and occasional actor. He is probably best known as the quarterback for the Washington Redskins in the National Football League(NFL). So just how rich is Joe Theismann? According to sources in mid-2016, Theismann has earned a net worth OF over $5 million. His wealth has been established during his football career, as well as during his career as a TV host, actor and restaurateur. Theismann grew up in South River, New Jersey where he attended South River High School, excelling not only in football, but also in basketball and baseball. He later enrolled at the University of Notre Dame, accepting a college scholarship. During his sophomore year, he became the starting quarterback for the Fighting Irish, setting several school records, such as for passing yards in a season, passing yards in a game, touchdowns in a season and completions in a game. He received All-America honors and led the team to consecutive Cotton Bowls. He was also in contention for the Heisman Trophy while at Notre Dame, finishing second to Jim Plunkett. In 2003 he was inducted into the College Football Hall of Fame. Upon his graduation in 1971, Theismann was selected in the fourth round of the NFL Draft by the Miami Dolphins, and by the Minnesota Twins in the 39th round of Major League Baseball(MLB) Draft. However, due to a contract dispute with the Dolphins, the player did not sign with the team; instead, he signed a $50,000 per season contract with the Toronto Argonauts of the Canadian Football League and spent three seasons with the team. His net worth was at its start. 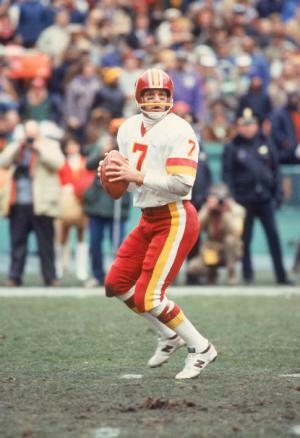 After his contract with the CFL had ended, Theismann signed with the Washington Redskins in 1974. During his first season with the team, he served as a punt returner, but in 1978 he became the team’s starting quarterback. In the following years, the player broke the team’s records for passing yardage (25,206), completions (2.044) and attempts (3,602). In 1982 he won the Walter Payton NFL Man of the Year Award for community service. He led the team to appear in Super Bowl XVII in 1982, and in Superbowl XVIII the following year. This enabled him to win the Bert Bell Award in 1982 and the league’s “Most Valuable Player” Award in 1983. He was also named one of the team’s 70 best players ever. His wealth was boosted considerably. Unfortunately, Theismann’s career ended in 1985 due to a leg fracture he suffered during a game against the New York Giants, being jumped on by the Giants’ players Lawrence Taylor and Harry Carson. The gruesome injury resulted in Theismann’s right leg being shorter than his left. He retired from his football career being aged 36. Theismann then served as a commentator at Super Bowl XIX, while he was still active. In 1986 and 1987 he became a color commentator on regional CBS coverage of the NFL In 1988 he began hosting the ESPN Sunday-Night Football broadcasts, and remained in that position until being replaced in 2007, since which he has done numerous Redskins pre-season games on CSN. In 2009 he joined the NFL Network television show called “Playbook”, analyzing game films. Theismann was also seen on NBC as a co-host of NFL games in 2010. The following year he co-hosted NFL Network’s program “No Huddle”. All contributed to his net worth. Theismann appeared as himself in several movies, including the 1981 “B.J. and the Bear”, the 1984 “Cannonball Run II” and the 1993 “The Man from Left Field”. He also appeared in the 2013 television series “Necessary Roughness” and the 2014 “Brooklyn Nine-Nine”. His most recent movie appearance has been in the 2016 film “Love on the Sidelines”, in which he plays the father of an injured football player. Theismann has also acted as a spokesman for a national TV ad for the pill Super Beta Prostate, as well as for the life insurance company Colonian Penn, which has greatly improved his wealth. Additionally, Theismann owns a restaurant that bears his name in Washington, DC, and is also the author of “The Complete Idiot’s Guide to Understanding Football like a Pro”; both contribute to his net worth. In his personal life, Theismann was married to Shari Brown(1970-84) with whom he has three children. The player then started a long on-and-off relationship with TV host Cathy Lee Crosby, but in 1992 he married a former Miss Connecticut Jeanne Caruso, but they divorced in 1995, which cost him nearly $1 million of marital property and $3,500 per month in alimony. He has been married to Robin Smith since 1996. TV Shows "Playbook" (2009), "NFL games" (2010), "No Huddle"
1 Nobody in the game of football should be called a genius. A genius is somebody like Norman Einstein. 3 The Miami Dolphins drafted Theisman in the fourth round of the 1971 NFL college draft, the 99th overall player selected in the draft, and the third player drafted by Miami. 4 He was inducted into the 2011 New Jersey Hall of Fame for his services and contributions to Sports. 5 He was nominated for the 2010 New Jersey Hall of Fame for his services and contributions to Sports. 6 He was nominated for the 2008 New Jersey Hall of Fame for his services and contribution to Sports. 7 He graduated from South River High School in South River, New Jersey. 8 High School teammate of wide receiver Drew Pearson. Pearson would later play for the arch-rival Dallas Cowboys while Theismann played for the Redskins. 9 After negotiations failed with the Miami Dolphins, who drafted him in the fourth round in 1971, Theismann elected to play for the Toronto Argonauts in the Canadian Football League. He was the starting quarterback against the Miami Dolphins in Super Bowl XVII which he was victorious. 10 Ranks 55th on NFL All-Time Passer Rating List (77.37). 11 Ranks 16th on NFL All-Time Yards Lost List (2,757). 12 Ranks 23rd on NFL All-Time Times Sacked List (340). 13 Tied with Ed Brown, Daryle Lamonica and Bart Starr at 59th on NFL All-Time Passes Intercepted List (138). 14 Ranks 51st on NFL All-Time Passing Touchdowns List (160). 15 Ranks 46th on NFL All-Time Gross Yards Passing List (25,206). 16 Ranks 42nd on NFL All-Time Pass Completions List (2,044). 17 Tied for 47th with Ken O'Brien on NFL All-Time Passing Attempts List (3,602). 18 When he broke up with Cathy Lee Crosby after 7 years, he sued her for half her net worth, leaving her financially ruined. 19 Washington Redskins All-Time Passing Yards Leader (25,206). 20 MVP of 1984 Pro Bowl. 21 1983 AP Offensive Player of the Year. 22 1983 AP NFL MVP. 23 1982 NFL Man of the Year. Awarded for community service and excellence on the field. 24 Still holds Notre Dame's single-game record for most passing yards with 526 against USC in 1970. 25 Finished second to Stanford's Jim Plunkett in the 1970 Heisman Trophy voting. 26 Was used as a punt returner at Notre Dame during his sophomore year, then took over at quarterback after seven games when starter Terry Hanratty was injured. Remained Notre Dame's starting quarterback until he graduated. 27 NFL career ended in 1985 when linebacker Lawrence Taylor of the New York Giants broke his leg on a sack during a nationally-televised NFL Monday Night Football (1970) game. 28 Played college football at Notre Dame. Originally pronounced his last name "THEES-man" until he enrolled, when Notre Dame's sports information department convinced him to change the pronunciation to rhyme with "Heisman." All during his senior season, they would promote him to sportswriters as "Theismann, as in Heisman!" in hopes that he would win enough votes for the Heisman Trophy. 29 Chosen as one of the 70 greatest Washington Redskins (June 2002). 30 Former quarterback for the Washington Redskins.